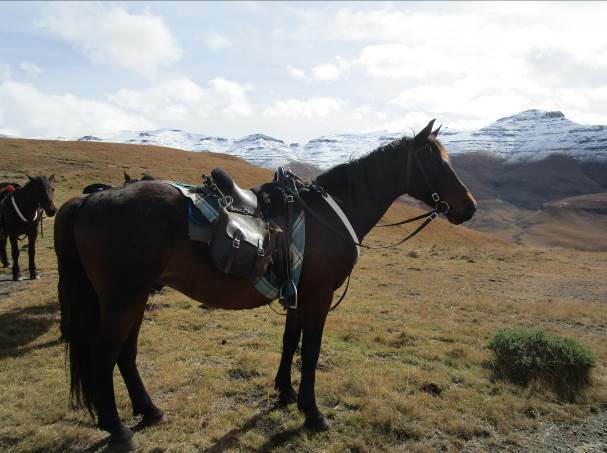 In our latest post, In The Saddle’s Chris Day tells us about her experiences on the exploratory expedition to Lesotho. 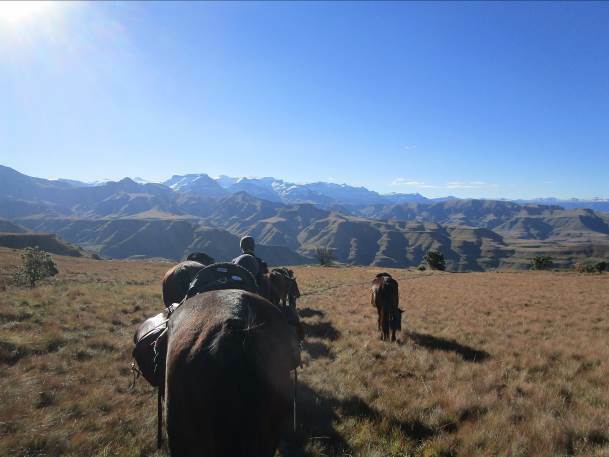 In May 2018 I had the honour to ride with an intrepid group of guests on our exploratory expedition to Lesotho. It has taken me a while to come down from the great heights we reached, both physically and mentally, and gather my thoughts about everything we saw and did. I reached the decision that words are insufficient to describe our experiences, so here are a few pictures that I hope capture some of the wonderful moments we shared. 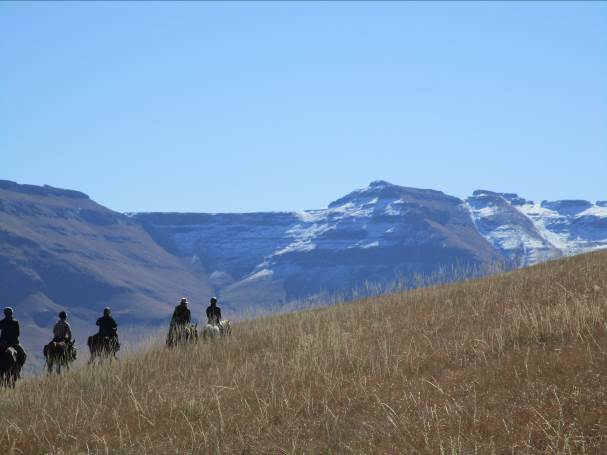 Having met our trusty Besotho ponies and, passports in hand crossed the border at Bushman’s Nek into Lesotho, within moments the mountains rose to greet us and we started to climb. 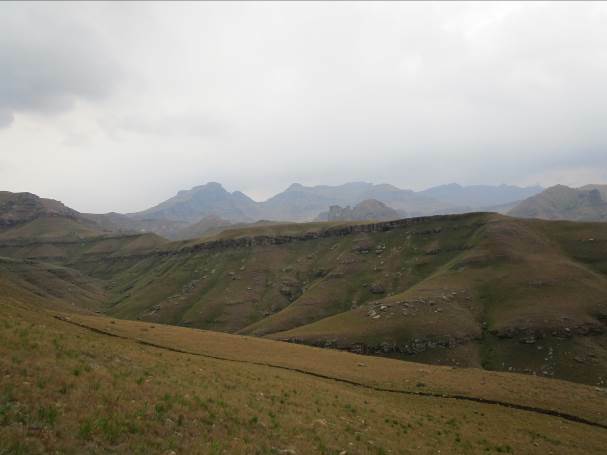 The views beckoned us on, and our trail led ever upwards to Thamatu Pass. The weather in the mountains is always unpredictable. 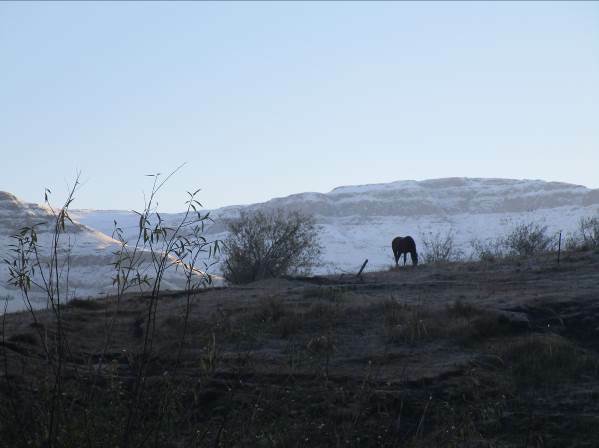 After riding through driving sleet on the first day, we awoke to a cold, frosty morning with snow on the mountains surrounding us. But the sun started to shine through with the promise of a golden day ahead. We were pleased to head out with the sun on our backs and a trail that kept us well below the snow line! We tried not to disturb the herds we passed, but were always greeted warmly, if a little shyly, by the villagers and herders tending them. We met many shepherds and their dogs high in the mountains; it’s a lonely life. 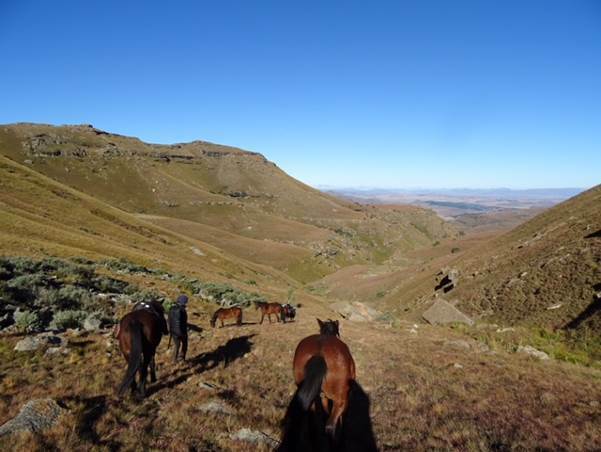 The trails led us from the mountains where the eagles soared above us, through narrow valleys and onto open grasslands where we could try out our horses’ paces. 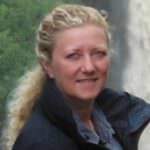 There were times, many times in fact, when we had to lead our horses over steep or rocky terrain. Thankfully, this was usually downhill! 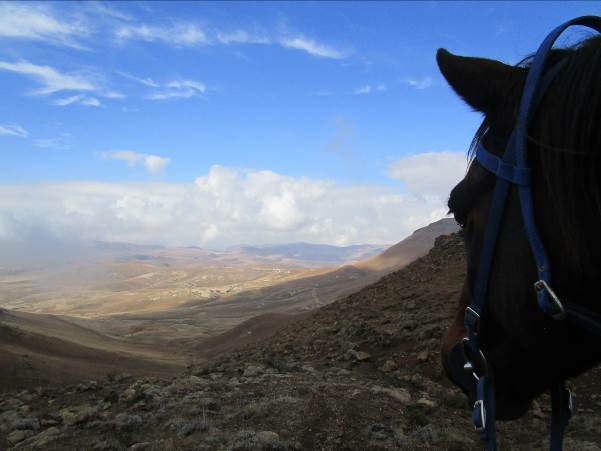 The highest point of the trail was riding from Thamatu village over a pass at 3,000m. 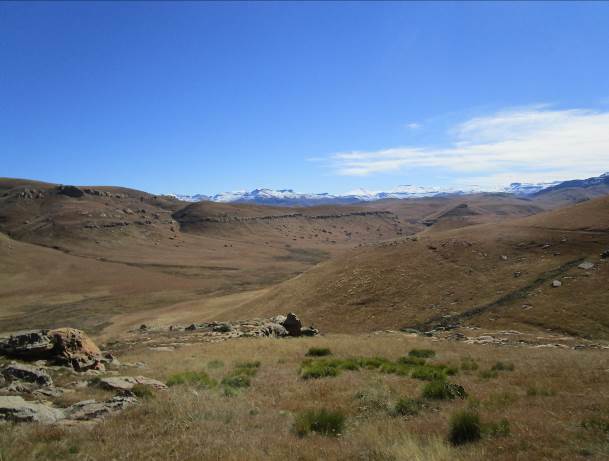 It seemed like the whole of Lesotho lay before us. 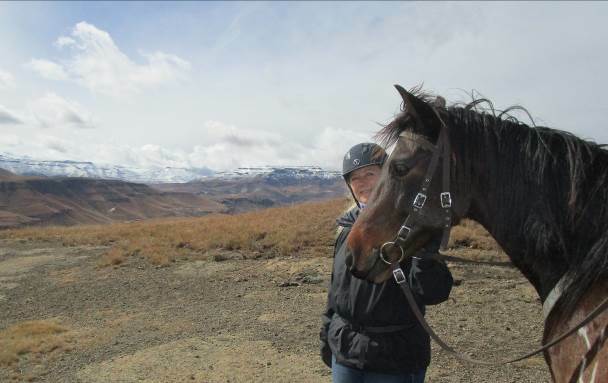 My horse, Skevango, seemed to like the view! As the clouds swirled around the ‘Three Bushmen’ I think we all had a reflective moment that will stay with us for a very long time. We traversed the mountains before dropping down into Monument Valley, with impressive formations in the weathered sandstone rocks. Blue, blue skies as we road up to Thule Pass at 2,900m. 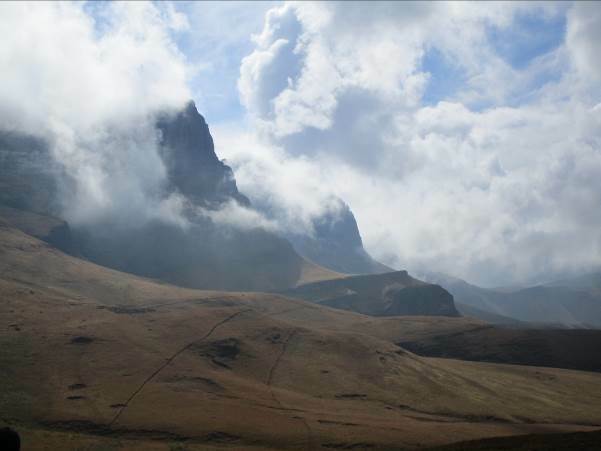 Sometimes, these mountains can make you feel very small and insignificant in the grand scheme of things ……. Is it really fair that the last views of the trail are so beautiful? At least it keeps you looking forwards to what will come, and not over your shoulder at what has been. 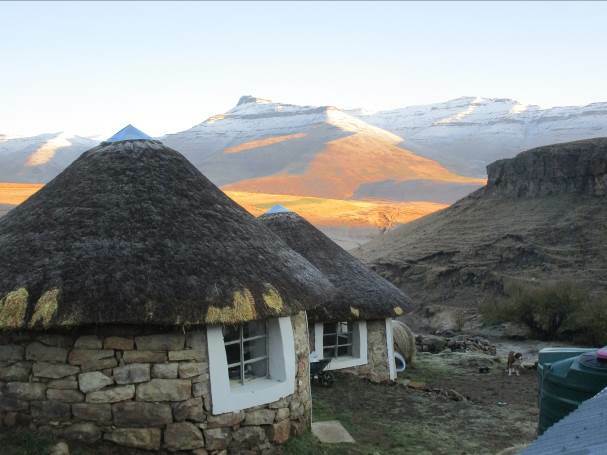 One thing is for sure, Lesotho simply begs for a return visit. 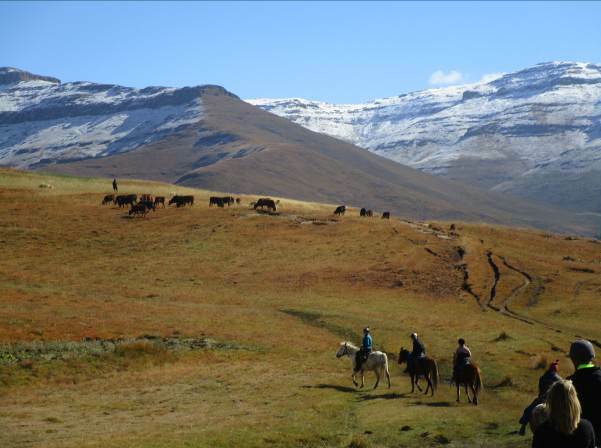 For more information on the Lesotho Expedition or to book your place please call Chris on +44 1299 272 237 or email chris@inthesaddle.com or visit our website. Wow, what an experience. Great photos Chris. I was on this ride …it is absolutely as fabulous as the description above describes .